In these days the most powerful version of a model line Polo with already traditional label GTI gets to the Volkswagen concern showrooms in the chosen countries. In first sight "sharp" Polo reveals its sporty ambitions by a characteristic mask of a cooler with a grate in the shape of a bee bank, which is optically linked with a central vent in an integrated bumper by a black varnish. A fine red line on a bottom edge of a cooler mask and unneglectable logo of GTI are now already inherent part of sporty models from VW garages. Doubled headlights are lined by "black glasses", which suitably match with a dark decor of car front side. Visual comparison with GTI version of a bigger Golf model indicates that Volkswagen intends to optical harmonization of its sportily oriented production. Identical design of 5-spoked 16-inch alloy wheels, or equally paced roof spoiler and a leading of double chrome exhaust just affirm this fact. Atmosphere in interior is "dynamised" especially by three-spoked steering wheel, which is together with a gearstick and a haft of handbrake overstuffed with a leather. Distinctly shaped seats are decorated by a typical checked overlay Interlagos. A surface of the central control console made of imitation of dull metal visually corresponds to polished aluminous pedals. A new Volkswagen Polo GTI and his bigger brother have common not only a visage, but also a conception of the engine. Also in this case a source of the power is 4-cylinder engine, filled by turbofan and it also has an intercooler of compressed air. A different character of smaller GTI is presented by less lift capacity and "more traditional" way of preparing fuel. Under the bonnet of Polo GTI we can find "1800 ccm engine" with 5-valved construction and two cam shafts, with multipoint injection Motronic (note: VW Gold GTI - engine 2.0 with direct injection FSI). Engine produces maximum output of 110 kW (150 hp) by sporty 5800 rpm, maximum torque 220 Nm starts to burden front wheels already by 1950 rpm. With these parameters it is the strongest serially produced Polo in its whole 30-year-long history. 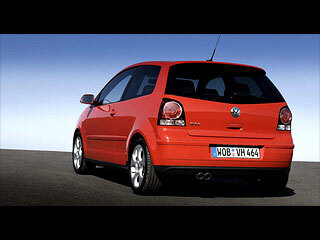 Acceleration to 80 kph takes only 5,8 sec., for 100 kph Polo GTI needs 8,2 sec. Extremely flat run of turboengine torque (in extent from 1950 to 4500 rpm it practically doesn't fall under the maximum) is also the cause of seductive values of flexible acceleration. 1164 kg-heavy Polo GTI on the 4th grade accelerates from 80 into 120 kph in already 7,5 seconds, on the 5th grade it takes 2,5 sec. longer. A reliable control over the car even by topspeed 216 kph is allowed by a sportily attuned chassis with standardly mounted ESP, which reduces a light height of bodywork by 15 mm compared to serial version. In order to secure an excellent stability and effective transfer of output onto road Polo wears exclusively tyres with size 205/45 R 16. A construction of the brake system with ABS and emergency brake assistant is based on four disk brakes with diam. 288, and 232 mm. 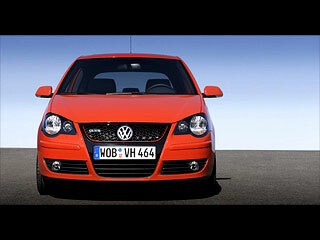 Polo GTI, in spite of its sporty character, doesn't lose anything from user values of favourite model line of Volkswagen, including unchanged interior, useful capacity for luggage, or divided back seats. Do you like the new Volkswagen Polo GTI?